Tripp Lite's Isobar combines superior technology with instantaneous response capability to absorb and shunt surges before they damage your sensitive electronic equipment. Indestructible, all-metal housing withstands abuse plastic surge suppressors cannot and ensures your Isobar will be on the job for years to come. The Isobar is corporate America's standard, with more than 10 million in use worldwide today! 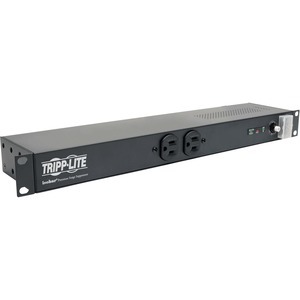 Tripp Lite's Isobar 12/20 Ultra Rackmount Surge Suppressor has 8 outlets (2-15 amp and 6-20 amp), a 3.65 m cord, diagnostic LEDs, and 1,200 joules of energy absorption. 17.5" x 4" x 1.8"